A couple weeks ago, my friend Stuart Rabner was tapped by New Jersey Governor-elect Jon Corzine (that's him with me in the photo on the right) to serve as his chief counsel. I didn't realize what this meant until I read in the New Jersey Star Ledger article that "One source close to the governor-elect's decision said Rabner would act as Corzine's 'ethical bodyguard,' helping him navigate the dirty waters of New Jersey politics." Well, if the new Governor of New Jersey (who by the way used to be the Senator of New Jersey) is in need of an ethical bodyguard, I can tell you from experience that Stu Rabner is your man! 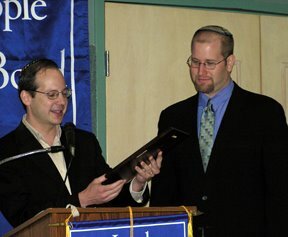 Stu is a friend from my days in Caldwell, New Jersey where we lived for three years and I served as Rabbinic Intern at the Conservative synagogue Congregation Agudath Israel of West Essex. Stu was a great shul President at Agudath who took the job very seriously. In the same article, William Megary, former special agent in charge of the FBI in Newark, said Rabner often soothed natural tensions between the agencies. "He's got a very calm demeanor and he's just a very gracious person," Megary said. "He is as effective as any mad dog prosecutor, but he does it as a gentleman." Rabner drives a five-year-old Dodge Intrepid, sings at his synagogue and enjoys doing yard work in Caldwell, where he lives with his wife, Deborah, a dermatologist, and their three children. He doesn't dispute his low-key image. "I don't think raising the volume is going to get you to a better result. My approach is to get more bees with honey," he said. Rabner first met Corzine when they both volunteered at a Newark soup kitchen four years ago. They didn't meet again until Corzine addressed Rabner's synagogue earlier this year about his efforts in the U.S. Senate to end the genocide in Darfur. "That resonated with me," Rabner said. Months later, when Corzine offered him a job, Rabner said, "I knew that I would be very comfortable working with somebody of his character." In the New Jersey Jewish News article, the columnist noted that in the NJ section of the Dec. 18 New York Times, columnist David Kocieniewski described Rabner's credentials as "downright fearsome" because of his lengthy experience prosecuting purveyors of political corruption. "You'll have to ask him what he meant," said Rabner. "My children certainly don't think of me as fearsome." Stu Rabner is certainly not a fearful guy outside of the courtroom, but he is a mentsch. If anyone can bring some mentschlichkeit to New Jersey politics, it's Stu. So, mazel tov to him and Debbie, and to their great kids. Update: Stuart Rabner then became Attorney General of New Jersey and now serves as the Chief Justice of the New Jersey Supreme Court.